When’s the last time you gave away product/services to a “well-connected” person in hopes they’d refer people to you? How did it work out? Have they sent a ton of business your way? Chances are, the well-connected person hasn’t even sent one paying client your way. No need to beat yourself up if this has been a strategy you’ve used to build your business. So many people think this is the right thing to do when they’re getting started or even when they’re looking to elevate their business to the next level. At a speaking gig recently I got into a discussion with a member of the audience. He was in the beginning phase of building his business and people were advising him to find well-connected people and give his services away for free. He felt he needed to do this in order to get momentum going in his business. I disagree. Almost every business owner I know (including myself) has made this same mistake. The #1 reason as to why you shouldn’t give your product/service away to “well-connected” people is they won’t value what they didn’t pay for. I would shout this from the rooftops given the opportunity, “People Don’t Value What They Don’t Pay For”. Maybe some part of you wants to prove me wrong. Maybe you have ONE example of when this did work in your favor. One example doesn’t negate the point being made, it almost NEVER pays off. However, many people will keep doing it anyway. So with that in mind, please allow me to offer you a few suggestions to increase your chances of success. First realize, just because someone’s well-connected, doesn’t make them a good source of referrals. Do your homework, check the person out. How often are they referring people? Look through their social media feed. Are they sharing events and information about people other than themselves? If not, they’re not likely to share about you. Look at their LinkedIn profile, have they written very many recommendations for others? Some people may be well-connected without being generous when it comes to helping others build their business. Just like how some people are stingy with their kind words, people can also be stingy with their praise of others publicly. Second, instead of giving away your product/service for free to the well-connected person, make an agreement about it. Be forthcoming that there is a cost to what they’re receiving. The cost is an introduction, a testimonial, a shout-out on social media, etc.. This way, it’s out in the open and the well-connected individual can decide if this is a good value to them. No more “hoping” the well-connected person will do what you want them to do. Get a verbal agreement at the minimum so each person knows what to expect and what’s expected of them. Third, lead by example. Are you being a good connector in your own life/business? How often are you doing shout-outs, writing reviews, etc. for others? It’s crazy to expect others to do these things for you when you’re not doing it for the people in your life. Praising someone publicly for something you appreciate about them is what I call “Pouring Love” all over the other person. 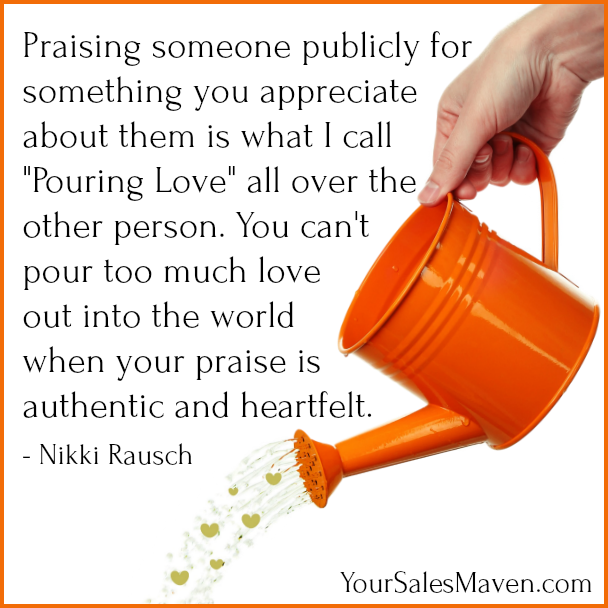 You can’t pour too much love out into the world when your praise is authentic and heartfelt. Wishing you continued success in all you’re doing plus a big ol’ helping of love poured all over you.